Some JLG Lift Trucks Service Manuals PDF shown above. The history of JLG began in the late 1960s, when John and his wife went on a road trip. The first model of the JLG lifting platform was delivered to the customer in 1970. JLG, and today, uses many design elements of that first machine, although more than 40 years have passed. 1969 - the foundation of JLG Industries. 1970 - sale of the first JLG lift. 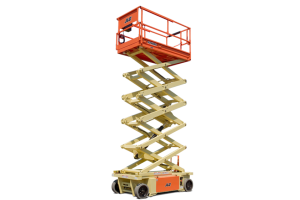 1973 - the first scissor lift JLG was produced. 1977 - the appearance of JLG in the European continent. Opening an office in the UK. 1979 - opening of a new scissor lift factory in Bedford, Pennsylvania. 1983 - opening of the JLG office in Australia. 1986 - The 10,000th JLG lift came off the assembly line. 1987 - opening of the second JLG plant for the production of scissor lifts. 1988 - The 50,000th lift came off the assembly line of the JLG plant in Bedford. 1999 - JLG buys Gradall - an American manufacturer of telescopic loaders and excavators. 2000 - JLG's sales for the first time exceeded $ 1,000,000,000. 2001 - from the conveyor of the JLG plant in Bedford, the 100,000th scissor lift JLG came out. Opening of the JLG office in Amsterdam. 2002 - the opening of a new JLG plant in Belgium, Maasmechelen. 2003 - the opening of a new plant in France, Tongenne. JLG buys SkyTruck and LULL and starts serial production of telescopic loaders for military needs. 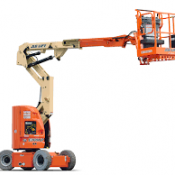 2004 - JLG buys MANLIFT and LIFTLUX, expanding its presence in the lift market for high-altitude work. 2005 - JLG enters into an alliance with Caterpillar. The beginning of the production of telescopic loaders in America and Europe for Caterpillar - the world famous manufacturer of road construction equipment. 2006 - JLG was bought by US company OSHKOSH, a code on the NY OSK exchange. OSHKOSH is an American manufacturer of military and special equipment. OSHKOSH produces military tractors and SUVs, fire trucks and emergency vehicles, airport tractors, garbage trucks, concrete mixers and much more. Having bought JLG, OSHKOSH expanded the range of products produced by lifting equipment models. 2008 - JLG opens a new scissor lift factory for the Asian market. 2011 - JLG, as well as it is necessary to the market leader, has presented to public a 150-foot self-propelled boom lift with a working height of 48 meters, the dimensions of which do not go beyond the dimensions when transporting on a low-frame site. Our days - JLG produces products under the brands JLG, SkyTrak, Gradall, Lull, Caterpillar, Deutz-Fahr and Liftlux. JLG is not only the leader of the world market of lifting platforms, but also grasps a serious part in the market of telescopic loaders. It took JLG 12 years to become the No. 1 company on the telescopic loader market. Incredibly, in such a short time, JLG has won more than 25% of the world market for telescopic loaders. Today, every 4th loader working in the world is produced at one of the JLG plants.